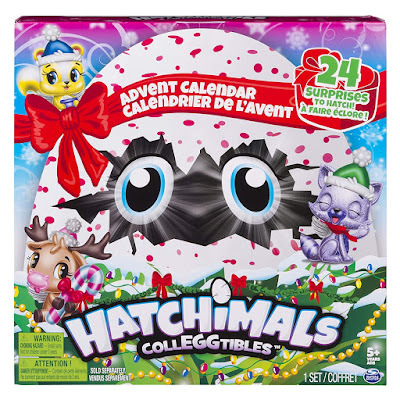 Head over to get this Hatchimals Colleggtibles - Advent Calendar for ONLY $17.99 (Retail $24.99)! Introducing the Hatchimals collectible Advent calendar! with 50+ surprises hidden behind 24 tiny doors, there's something new to discover each day – including exclusive characters! open your Advent calendar and you'll find a winter scene with pop-up snowmen, festive trees and more! find exclusive characters and nests, accessories and more as you open up a door a day! with each new accessory or character, you can build out your 3-D holiday scene. And for the first time ever, these festive Hatchimals come with attachable accessories! put a bow on your new friend or peg a character to a toboggan for winter Wonderland fun! on the last day, you get to hatch a Hatchimals collectible! this holiday-themed egg features a blue ombre shell with a purple snowflake! rub the snowflake until it turns pink, then gently press down to crack the shell and meet your new friend! you can even use the exclusive sparkly snow nests to keep your Hatchimals cozy! have the hatchiest holiday yet with the Hatchimals collectible Advent calendar!